Earlier today, Apple CEO Tim Cook announced that, starting in 2013, Apple would start investing over $100 million in local business to build Macs in the United States. Even more intriguing, he said one model of Mac would be made exclusively in the U.S. But which one? Tim Cook wouldn’t say, but when you think about it, there’s one obvious contender: the Mac Pro. Here’s why. Let’s start off by asking ourselves why Apple builds its products overseas to begin with. There are two main reasons why Apple makes its products overseas. One is cost. The second is labor. Let’s look at these one by one. It’s often said that the biggest reason why Apple makes its products in China and elsewhere is because of labor costs, and that’s certainly a factor: the average assembly line worker in China costs a lot less to employ than it would cost in America. It’s estimated that an iPhone made in America would cost Apple about $65 more to make in the United States than it would in China, not just for the cost of labor, but for the cost of shipping supply chain components over here for assembly. That might not seem like a significant number, but it’s actually pretty big: the iPhone 5, for example, costs $207 for Apple to make, so we’re talking a 31.4% increase in build costs to Apple… a cost increase Apple would pass on to consumers. Apple products are already criticized by many as being overpriced, and certainly a 30% increase in build costs would negatively effect most Mac sales. But the Mac Pro is different: it’s already a professional-only product. The retail price of the Mac Pro doesn’t matter as much to businesses, so Apple could bump the price and preserve their margins without seeing sales plummet. Apple can afford to make the Mac Pro domestic, and professionals can afford to buy a domestic Mac Pro. In the past, this has been a big problem for Apple when they have thought about making products in the United States. Apple has said in the past that “the U.S. has stopped producing people with the skills we need” to manufacture at the scale Cupertino needs. And in the past, Steve Jobs himself has complained to Obama about how hard it is to keep find trained engineers in the United States: talented students come to America to study engineering, but are then forced to leave the country because of prohibitive immigration laws. What it all boils down to is that China has the kind of workers Apple needs. Not just skilled engineers, but workers who have spent the last decade gaining expertise necessary to build Apple’s increasingly complicated, thinner and harder-to-make products. Not to mention the sort of factories and facilities necessary to get super-slim iMacs, MacBooks, iPhones and iPads out the door. But compared to those products, the Mac Pro is a much easier-to-build machine. It’s not unibody: the Mac Pro’s user-expandability is a major part of the computer’s appeal. It’s a Mac tower, and inside, it’s not all solid-state, but a bunch of separate components slotted into a fairly standard motherboard. This is the kind of Mac that you don’t need sophisticated labor to build: it’s plug and play! And while no one has ever made a computer as complicated as an iMac in the United States, tower PCs more or less similar to the Mac Pro are made here every day. Tim Cook made clear in his interviews that Apple’s $100 million domestic investment was just a first step, and that if it works out, there will be more Apple products made in the United States to come. 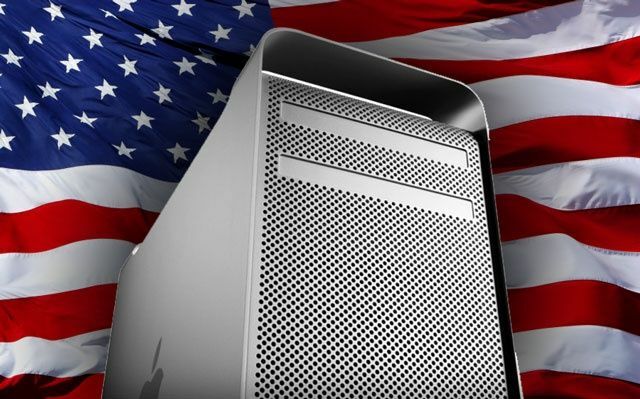 The Mac Pro is a fantastic choice for such a first step: it’s a niche product with a high sticker price and a clientele that can afford to pay more for a “Made in the USA” sticker, while at the same time requiring the least manufacturing or labor sophistication of any of Apple’s Mac line-up to actually produce. And what do you know? Apple’s already promised a new Mac Pro coming in 2013.